Hi, I've been working slowly on a new Gn15 layout, which I am attempting to get finished in time for an exhibition in November (7th in Barnstaple to be precise) and thought that a few photos would be interesting. The pictures below were taken some time ago and thankfully quite a bit of progress has been made, but I have not had chance to get any more photos taken. 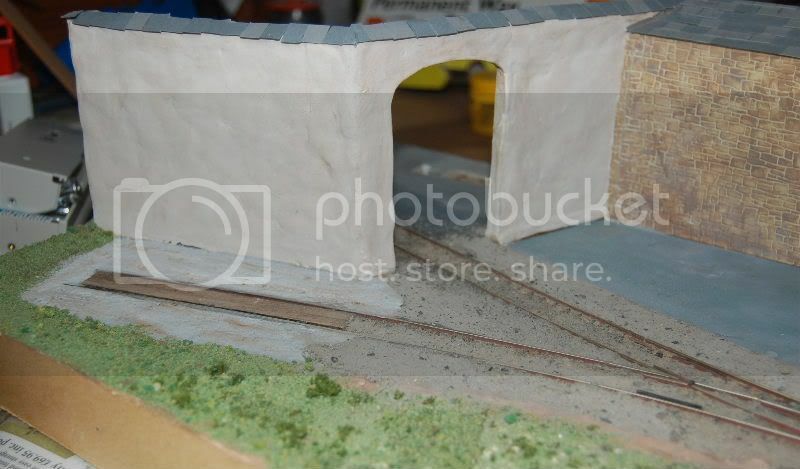 The basic theme being an estate railway, with the track passing through the arch in the wall (just out of shot to the left). I am thinking about positioning some trees behind the wall and possibly a backscene with a photo of a national trust house in behind. There will be a loading bay in front of the sliding door, where supplies for the estate can be stored / loaded. The area in front of the old stables will (hopefully) be used to store statues / large plant pots / other estate related items. The track is Peco 00, and now ballasted and then buried to hide the sleepers. Some work has been completed on the scenery. I will post more photos in the next few days. I like the trees idea, but remember how tall a tree is in Gn15. 40 ft, a small tree, is about 20 inches tall. I am making boxes to transport three trees I have made and they turn out to be quite big to take the spread of the branches. Good luck with the layout it looks like a great start. 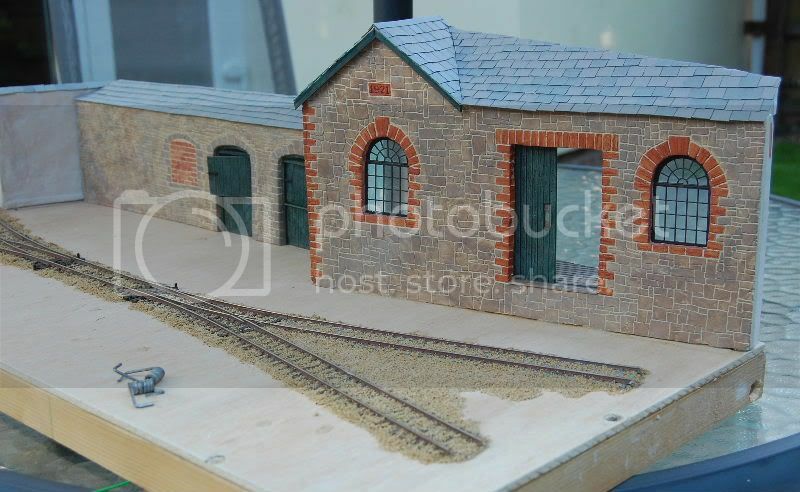 Yes there will be a small fidle yard to the left, which currently is only long enough for one loco and one wagon, but may be extended. I take your point re the trees, perhaps tall bushes may be more appropriate. I've not yet decided fully, so watch this space. Looking very good and I really like the stonework, it looks very much like good old Devon sandstone. Nice touch with the bricked up window in the stable block. Will be looking forward to the next set of pics and knowing how you have the eye for scenic work, I'm sure we are in for some treats. I am really looking foward to following the rest of this build. What you have done so far is very impressive. great job.Love the stone work,xlnt. How did you do the slate on the roof? The windows are modified Grandt Line (0 scale). The stone work is carved Das, having been sanded 'flat' after glueing using PVA onto foamboard. The windows then fitted and any gaps filled with Green Stuff. The stones are then painted with Citadel / Games Workshop 'stone' colour (I can't remember the actual name). 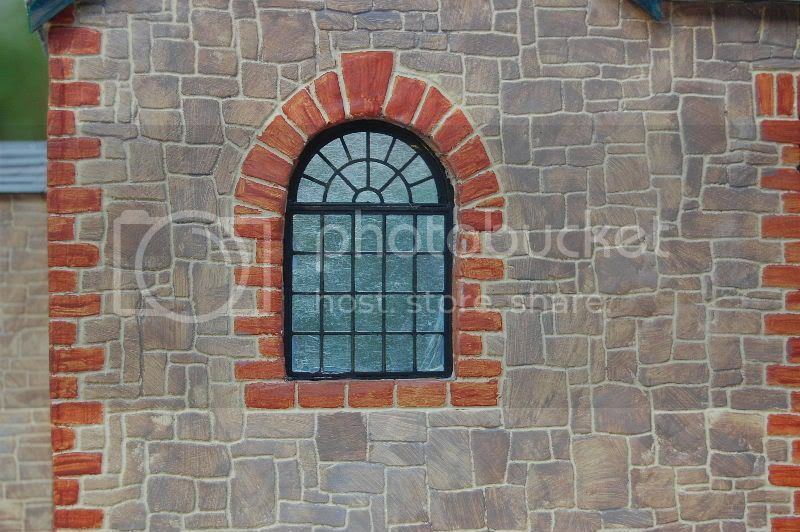 Once dry, the brick and stone colours are drybrushed acrylic. The slate roof is simply coloured paper (from an arts store), cut into strips then individual slates. Each row is glued using PVA. It doesn't actually take too long to do. The lead flashing is white paper coloured using a felt pen. The stable doors are plasticard, suitably scribed and grained. Painted humbrol wood brown then dry brushed using acrylics. Thanks for interest. Hopefully I will add some updates later this week. Steve, I have been working on this for a while, but was in two minds whether to add to the forum, but a looming exhibition helps to focus the mind to actually finish it! I think that the stone colour came out more by luck than judgement, but wanted to keep the colour pallet simple. Must be the local influence! Love it! The stone work is inspiring. Hi Dave, I only noticed these after posting the photos. They have since ended up in the spares box - may have a use one day! I absolutely love how you did the building,but what is CARVES DAS? 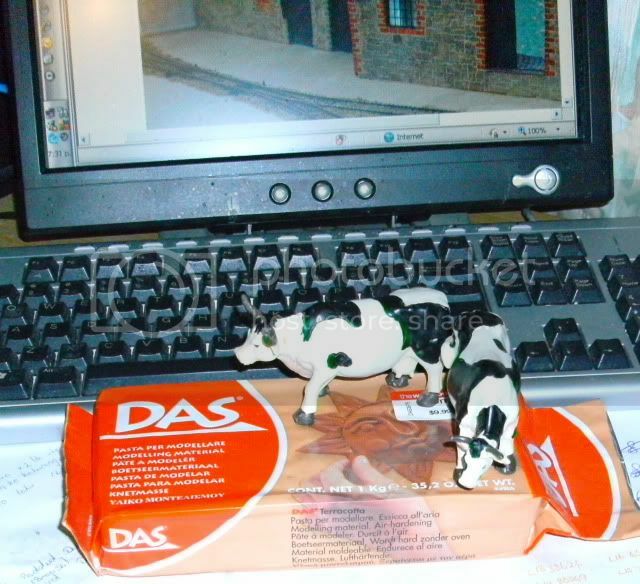 DAS is air dried modelling clay available in white or terracota which is easilly carved or perhaps more accurately the surface is scratched to represent bricks or stones after it has dried for about 24 hours. You answered the question better than I could. A fellow modeller uses tile grout - the ready mixed variety in a tub from the local DIY / hardware / decorator store. This is applied in the same way, left to dry and sanded flat. Then before carving, the surface to be carved is wetted with water to soften the grout to allow it to be carved. If left dry, it will just break the edges when carving. I have attached a couple of photos showing some of the progress taken earlier today. Weather not great, but just about ok to get these photos. The exit to 'fiddle yard'. 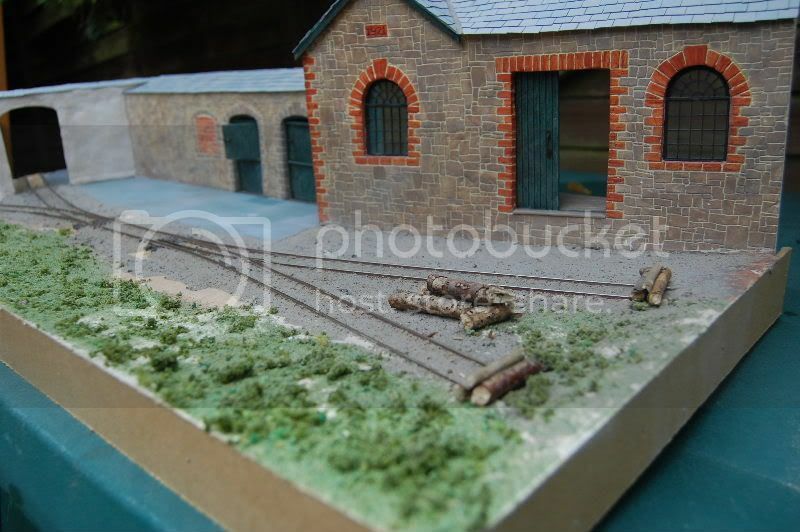 There will be a small engine servicing area / shed in front, where the timber has been glued between the rails. End of sidings. The scenery still needs lots of work, but a start has been made. The sleepers have been largely buried (still need to finish around the point blades) has been achieved using the soot left from the garden barbeque! The 'logs' are twigs from the garden. Still plenty to do, but will add updates when more progress made! I like the feling of space you have and the angles on the buildings work well, giving unusual lines for the eye to follow. Hoping I will get to see this one for real sometime. mud magnet wrote: I take your point re the trees, perhaps tall bushes may be more appropriate. I've not yet decided fully, so watch this space. TALL KNIGHT: When you have found the shrubbery, place the shrubbery here, beside this shrubbery ... only slightly higher, so you get a two-level effect with a path through the middle. bring me a shrubbery! where did you get that foliage in the front? looks GREAT! Nice work, particularly like the stonework, looks like you have studied real walls closely. I remember an art teacher saying to the class in Morrab Gardens Penzance, draw that wall, DONT draw what you think you see, draw what is THERE!! 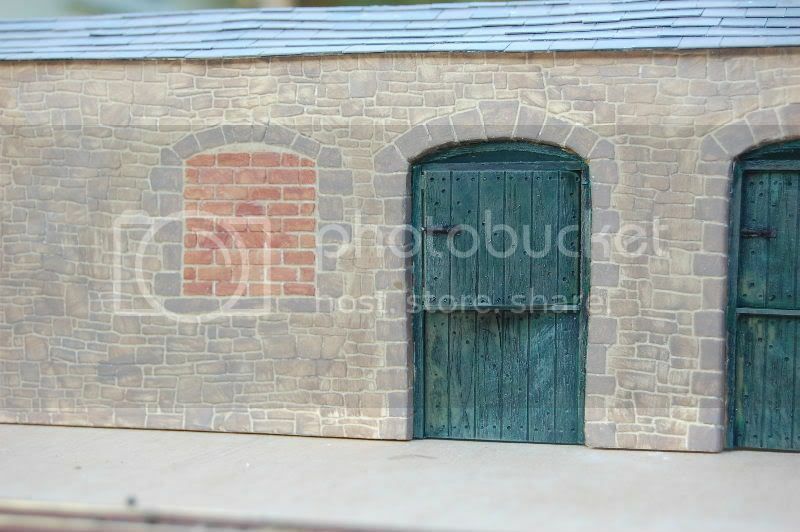 I also like the way the storage area in front of the Stables is naturally bounded by the wall on the left ( stable to Arch ) and the other storage building sticking out. Did you finish off the bare Das with a slightly coarser grit to give that "Stone grain" texture? Hi Don, the Das is only shaded flat with 100 grade sandpaper (sorry glass-paper) to get it relatively flat. The corner bricks have been carved firsted, after had marked the coarses in pencil. The stones are carved by eye, trying to get the right balance between stone sizes and realism. As noted before, after painting all over 'grout' colour, the stones are dry-brushed. The dry-brushing adds to the texture effect. Thanks for comments. More updates to follow.